NBC reported Monday that John Travolta would be flying aid to Haiti. Travolta was met by a team of Volunteer Ministers who are already in Haiti assisting victims of the earthquake. The Church of Scientology has organized two chartered flights to Haiti to take doctors, medical supplies and Volunteer Ministers to the stricken country. 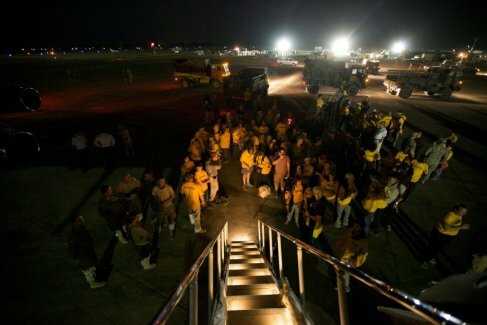 The first Scientology Disaster Response Team arrived in Haiti Sunday January 17th. They flew ut of JFK in New York with 126 doctors and nurses from the Haitian Physicians Abroad, paramedics from the Bedford-Stuyvesant Volunteer Ambulance Corps, and Volunteer Ministers from a half-dozen states. The 2nd flight, a 168-seat aircraft, took off from Los Angeles Thursday January 21, stopped at Miami International Airport to pick up additional medical personnel and Volunteer Minister teams, and continued to Port-au-Prince. More than half those on this flight were medical professionals, including doctors and nurses from the Association of Haitian Physicians Abroad (Association des Medecins Haitiens a l’Etranger) and from the Church of Jesus Christ of Latter-day Saints. Also on board were Scientology Volunteer Ministers from cities across the United States. The Pasadena Parishioners are proud to support our Volunteer MInisters in Haiti and we’ll be keeping you updated on their activities.